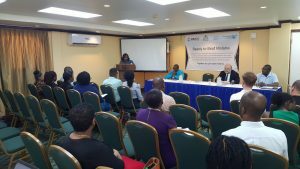 Junior Minister of Public Health, Dr. Karen Cummings addressing the opening of a Malaria Project Insights Validation workshop. Among those seated at the table are US Ambassador to Guyana, Perry Holloway. Guyana’s fight against the mosquito-borne disease, malaria, is coming up against a few stumbling blocks due to a lack of knowledge about transmission of the disease, according to preliminary findings of behavioural change survey. The findings were made by a team being spearheaded by the United States Agency for International Agency’s (USAID) Breakthrough Action Project and the Ministry of Public Health which on Thursday held a Malaria Project Insights Validation workshop. The purpose of this workshop is to allow stakeholders to review and refine the insights gathered through formative research being conducted by Breakthrough ACTION and the MoPH, which will ultimately inform the co-creation of solutions to improve the uptake and adherence to malaria testing and treatment services. Rohan Doherty of Think Action said field research conducted in the mining areas show that persons in those communities do not know that trained testers are available to conduct malaria tests, and they do not know what is the correct means by which malaria is transmitted. These include using bush medicine to treat malaria and believing that malaria is contracted by drinking dirty water or that the disease could be prevented by eating healthy foods and keeping physically healthy. “Once we understand how people think about malaria, we can then start to think about what’s the best interventions we can create that will change those behaviours so right now we don’t actually know what those interventions would be , and what the things we would implement that would change these behaviours are,” he said. Doherty said a number of behavioural change ideas would be developed, tested and evaluated early next year before a decision is taken to roll them out on a large scale in Regions 7 (Cuyuni-Mazaruni) and Region 8 (Potaro-Siparuni). Junior Minister of Public Health, Dr. Karen Cummings stressed the need to abide by national treatment guidelines to reduce artemisin resistance which in emerging in the Guiana Shield, something Guyana is concerned about. “Deviations from the norms established, coupled with the pressure on the malarial parasite to evolve have led to the detection of mutant genes in the malaria parasite. Guyana is very concerned about what this may mean for the drive to eliminate malaria,” she said. Dr. Cummings said she looks forward to the findings of a 2018 study on the efficacy of malaria treatment. “It will be interesting to see how the results inform policy in whether there is need to adjust the National Treatment Guidelines,” she said. Doherty is part of USAID’s Breakthrough ACTION Project which is providing social and behavior change support to this multi-donor partnership with the Government of Guyana, through a project that is being implemented by the US-based John Hopkins University. Implementation of the project began one year ago and is slated to conclude on September 2019. The US Embassy said Breakthrough ACTION Guyana is designed to help the MoPH to reduce malaria transmission by developing tools and solutions to increase early testing and treatment. “It also seeks to build the capacity of volunteers in mining camps and communities to accurately administer malaria tests and effectively counsel individuals for improved health outcomes. The promotion of long-lasting insecticide treated bed-nets to prevent infection is a secondary component of the Breakthrough ACTION project,” the embassy said. US Ambassador to Guyana, Perry Holloway hailed this country’s success in fighting malaria between 2010 and 2015 when there was a 58 percent reduction in cases. “Guyana has made excellent progress in reducing malaria,” he said. adding that the validation workshop is aimed at developing strategies to fight against the disease. “The intention is that with technical and medical experts, and most importantly the participation and collaboration of the communities affected by malaria, we can create solutions to barriers that weaken malaria prevention efforts and delay testing and treatment,” Holloway said.